Sterling Systems & Controls, Inc. designs and manufactures Hand Prompt Stations (above picture shown with optional bag dump) to meet the specific requirements of each customer as needed. 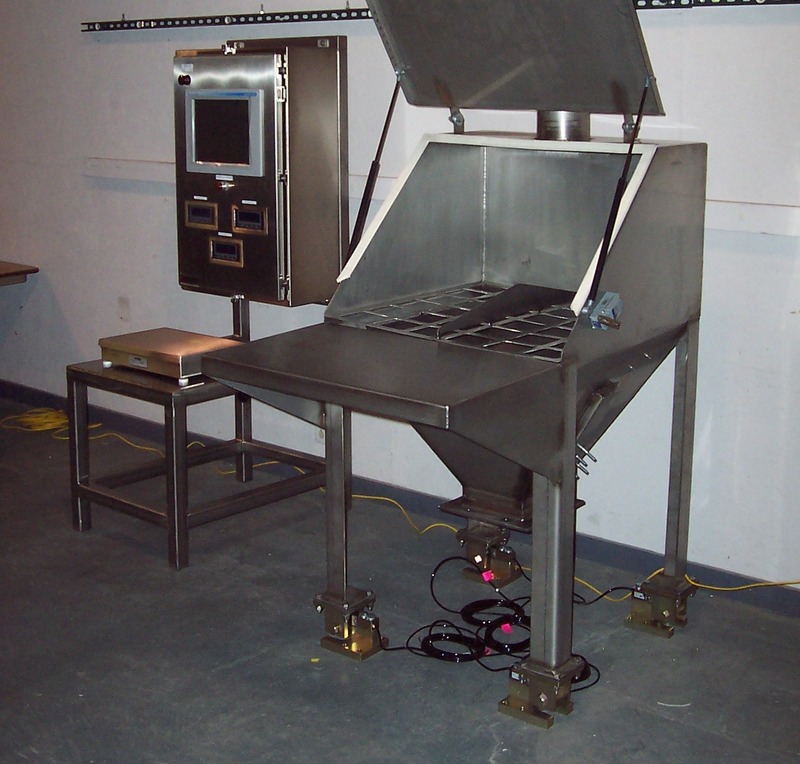 The Hand Prompt Batching Station serves a wide range of industrial applications where the negative effects of time consuming and problematic manual batching needs to be eliminated. The Hand Prompt Batching Station is a semi-automatic batching system that still requires operator involvement through each step in the batching process, but provides automated operator instructions or prompting, ingredient validation and lot tracking, automatic weighing with over/under tolerence control, etc. This system will eliminate bad batches that result from operator error and interruption. The operator no longer needs to keep track of where he is in the batching process, the automated Hand Prompt Batching Station does that for him automatically. No missed ingredients! No bad batches! The Hand Prompt Batching Stations’ PC will ask the operator to weigh ingredients. The Sterling Systems & Controls’ Hand Prompt Controller will sequence an operator through a formula one ingredient at time. The primary advantage of the system is to ensure that each ingredient is added to the container, is within a programmed weight tolerance, and from the correct ingredient lot before the controller will index to the next ingredient to be added. This will ensure the validity of all batches created by the operator. The Sterling Systems & Controls’ Hand Prompt Batching Station provides real time records for each batch produced. This enables the highest standards to be maintained by ensuring a consistent batch product. As batches are produced, the batching controller records the batch data and can print batch reports to a ticket printer (optional). Additional reports and data can be printed on a standard network printer (batching station will need to be connected to your network) if one is available. The printout provides a hard copy of each ingredient by identification along with the required and actual formula weights. A time and date is also stamped on each report at the start and end of the batch. If an alarm condition occurs during batch processing, the batching controller can print an alarm message enabling a supervisor to review the performance of the operator and track problems that may occur later. Batching reports can be printed automatically at the end of a batch, or can be recalled and printed on demand through either the Hand Prompt Station software or WebCentral (optional Supervisory Control software application). The Hand Prompt PC maintains its database by automatically performing routine maintenance and backup procedures. A barcode scanner (optional) can be attached to the Hand Prompt Batching Station control panel using a NEMA 4X quick disconnect bulkhead connector mounted on the control panel. A wireless version of the barcode scanner is also available. Prior to any wash down of the Hand Prompt Batching Station control panel the barcode scanner must be removed. Other options are available. Ingredient Lot Numbers are assigned and printed at a remote PC and Printer (by customer or optional) using a custom software package included with the Hand Prompt Batching Station. Lot Numbers will be 30 characters (or less) long, allowing room for an 11 digit Julian Date/time, 5 digit Vendor Code, and 5 digit Item Code, plus extra characters for future expansion if necessary. The Hand Prompt touchsceen computer within the control panel will need to be placed on a local customer supplied Ethernet Network in order for any existing customer PC to communicate with the database residing on the Hand Prompt touchscreen computer. Any customer PC’s which might be using the WebCentral software (optional) to communicate with the Hand Prompt Batching Station will also need to be on the same network as the Hand Prompt touchscreen computer. If an Ethernet network infrastructure is not already in place in place, Sterling Systems & Controls can assist with specifying networking hardware and cabling if needed. The Hand Prompt touchscreen computer will include an integrated Ethernet Network Adapter, but no other networking hardware is included with the Hand Prompt Batching Station.